This is the time frame from where you are today to when you exit the marketplace. The accumulation phase could last many years until you choose to retire or it could end abruptly without notice. Three reasons your accumulation phase might end prematurely are job loss, injury or sickness or an unexpected death of family wage earner. Without notice, a family might have rely on their balance sheet to provide the needed cash flow to maintain their lifestyle. Therefore, assets must be positioned to allow a cash flow steam to occur at any given moment. This is paramount to a solid holistic financial strategy. We explain how our planning process works and share our unique philosophy on the financial world. More importantly, we take the time to understand what you want to achieve through our work together. It is this list of priorities that will serve as the foundation of your planning process. All your financial data is entered into The Living Balance Sheet®(LBS) giving you a wide-angle view of your progress across our four interdependent financial domains. Set up data feeds into LBS to create a Living Balance Sheet® that updates daily. Before we have the right to build for tomorrow, we must secure your today. The Protection Meeting ensures you protect the ground you have already taken and give yourself the opportunity to be successful in the future. Instead of jumping straight to product recommendations, we must first understand the overarching strategy and agree that the strategy is best for you. 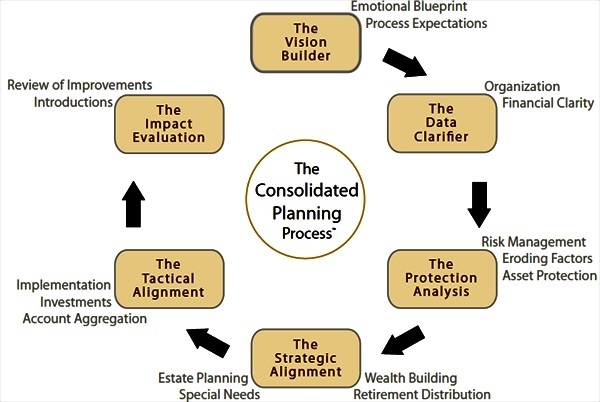 We will evaluate several strategies with you and compare their results across all four interdependent domains so we can truly understand the effects of our planning- not only today but in the future as well. Only then will we be in a position to recommend what specific products or services are best for you and your family. Here we move from the big picture to the details and begin to implement the tactical changes needed to make the strategy work. These changes are dictated by the strategy that precedes it and routinely include adjustments to various insurance and investment programs or execution of legal documents as examples. At the end of the initial planning process, we will sit down to assess how far we have come through the course of our work together, as measured by what you said was important to you. Upon successful completion of the process, we hope to have the opportunity to offer the experience you had to others who you think would value our boutique process.